This is the same keypad as the hugely popular EASY-KA but with numbers that are backlit upon activation of the keypad for more visible nighttime use! The Estate Swing EASY-KA Stainless Steel Keypad is a great gate accessory for those owners who want to have secured yet stylish gate access. The keypad is housed in an aluminum cast with a stainless steel finish, to accentuate the style already attributed with Estate Swing Gate Openers. Because of its wired operation this unit will work with the Estate Swing gate openers AND also most other openers and may be used with many other security and access devices. The real highlight of this keypad are the features that are only found on keypads three times the price plus some unique features never before included. The Estate Swing EASY-KA can also be made to be time secure. Have your keypad active or inactive at the times of your choice without interruption of programming or power when used in conjuction with the 12V Digital timer (for 12V systems) or the 24V Digital timer (for 24V systems). 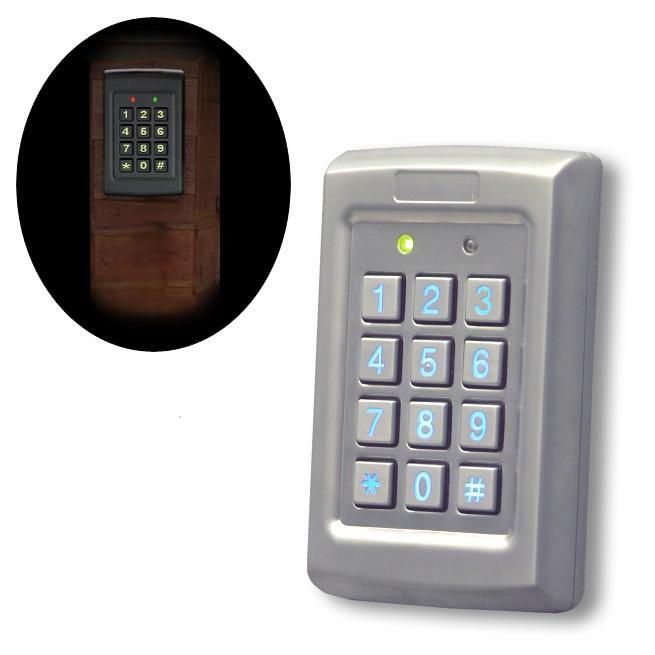 "The Estate Swing EASY-KA (Easy Keyed Access) keypad is a must for any of our customers that are willing to run wire to their keypad, which incidentally makes the operation of their gate via keypad more reliable then wireless. The question is where do I start with this keypad? The first thing I would like to point out is the materials used and the look of this keypad. It is made of aluminum with a stainless steel finish. And a high-grade stainless steel finish at that, much like you would find on a Viking range or other top quality stainless steel appliance. The one thing I wish I could convey over the internet is the feel of this unit, it’s weight compared to all others will astound you and really convince you of the quality craftsmanship that will lead to many years of flawless operation. Secondly are the features of the EASY-KA. A demonstration of its versatility is having two relays for multiple device activation. Basically one could hook the keypad both up to the lock of a pedestrian gate in addition to the main vehicular gate. Another big feature of this keypad is the different security levels and modes. Depending on what mode you set the keypad in, you can set up users to have different access grants. For example, a Normal user will not be able to enter during secure mode, but a master user and secure user can. But a secure user must have a primary and secondary code to get in. This level of security is new to a keypad of this price range, yet another high priced luxury brought to the masses by Estate Swing. On the same security note, the back of the keypad is equipped with a tamper proof sensor. If someone was to remove the keypad from the post it was mounted to the sensor would be tripped and lock out the intruder. Some other unique features are 12 or 24V operation, which allows it to be used with many different operators. A secure push button hookup; most push buttons wired to locks or gate openers don’t have any options for altering how they operate, they simply close a connection. If you hook the push button up through this keypad, it will still work to open you gate but you also have some control about how and when the push button will function. Lastly this keypad has a built in heater, a feature not found very often but possibly should be. The heater can be turned on and off and has relatively low energy consumption so is still fine to run of most gate opener batteries or power outputs. It will allow your keypad to work without the risk of icing up down into the negatives. We take great pride in knowing our accessories and understanding how they work. The EASY-KA Keypad has been thoroughly tested by myself and my team and meets our high standards for recommended accessories."